Fresh as a daisy after all these years, Satyajit Ray's 1955 spellbinder that won "Best Human Document" at the 1956 Cannes Film Festival, comes underpinned by a tumultuous Ravi Shankar sitar and paints a ground's-eye portrait of life in an impoverished Bengali village. 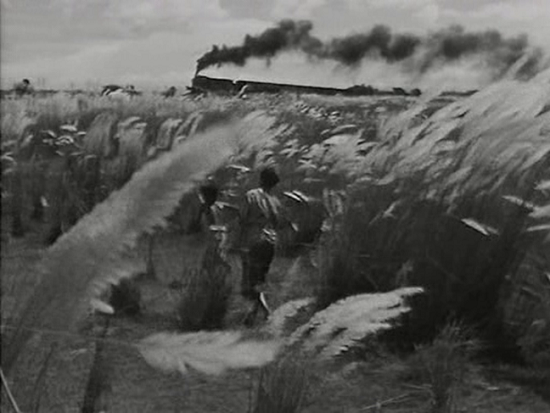 Pather Panchali is today considered as one of the greatest films ever made. Akira Kurosawa summarized the effect of the film as follows: "I can never forget the excitement in my mind after seeing it. I have had several more opportunities to see the film since then and each time I feel more overwhelmed. It is the kind of cinema that flows with the serenity and nobility of a big river... People are born, live out their lives, and then accept their deaths. Without the least effort and without any sudden jerks, Ray paints his picture, but its effect on the audience is to stir up deep passions. How does he achieve this? There is nothing irrelevant or haphazard in his cinematographic technique. In that lies the secret of its excellence." 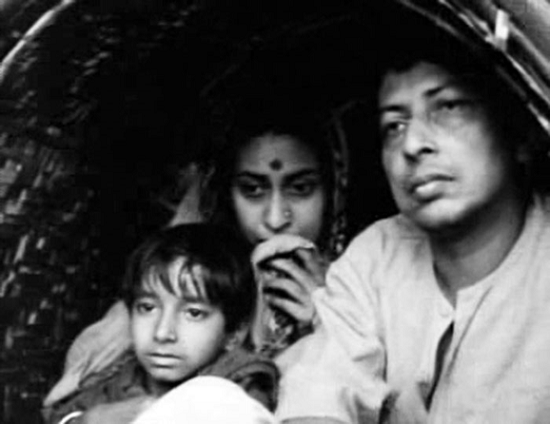 Pather Panchali is Ray's debut film, and the first film of his 'The Apu trilogy'. The remaining two films of the trilogy, Aparajito and Apur Sansar, follow Apu as the son, the man and finally the father. Though the film deals with the grim struggle for survival by a poor family, it has no trace melodrama. What is projected instead is the respect for human dignity that imparts it a universal humanist appeal. The time is early twentieth century, a remote village in Bengal. The film deals with a Brahmin family, a priest - Harihar, his wife Sarbajaya, daughter Durga, and his aged cousin Indir Thakrun - struggling to make both ends meet. Harihar is frequently away from home on work. The wife is raising her mischievous daughter Durga and caring for elderly cousin Indir Thakrun, whose independent spirit sometimes irritates her. Apu is born. With the little boy's arrival, happiness, play and exploration uplift the children's daily life. Durga and Apu share an intimate bond. They follow a candy seller whose wares they cannot afford, enjoy the theatre, discover a train and witness a marriage ceremony. They even face death of their aunt - Indir Thakrun. Durga is accused of a theft. She falls ill after a joyous dance in rains of the monsoon. 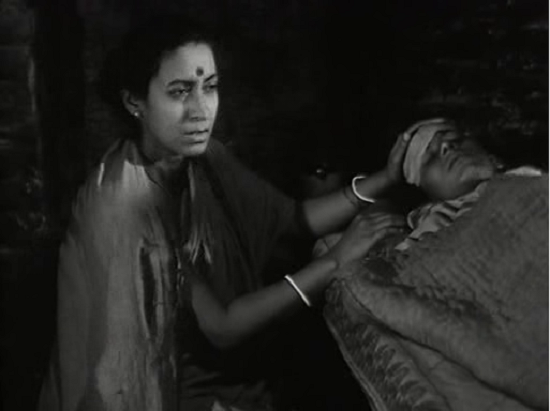 On a stormy day, when Harihar is away on work, Durga is taken ill and passes away. On Harihar's return, the family leaves their village in search of a new life in Benaras. 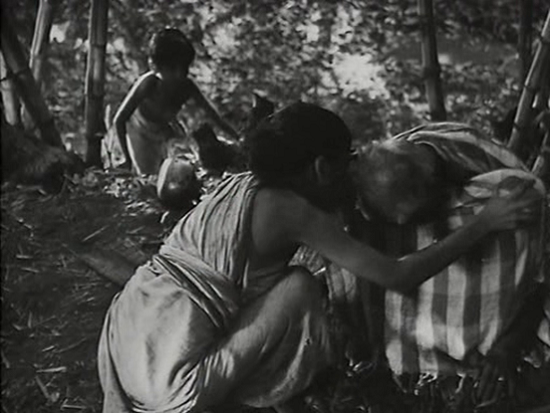 The film closes with an image of Harihar, wife and son - Apu, slowly moving way in an ox cart. The movie is replete with many episodes and sequences of great intensity and charm. Consider the scene of realization of Durga's death by Harihar. This happens when Harihar returns to find his house ruined and his daughter dead, followed by Sarbajaya’s breakdown. Her grief-stricken wail is expressed by her own voice by the Tashehnai playing a passage of high notes; the effect is to intensify Sarbajaya’s pain and transform it into nobler and universal. Another premeditated sequence is the passing away of Indir Thakrun. Her solitary death, followed by the children discovering the corpse, was entirely Ray’s invention; as Durga playfully shakes her squatting form, it crashes over and her head hits the ground with a sickening thud. Though Chunibala (the actress) demurred initially to act this scene, Ray persuaded her to do it and Ray says in an interview that there was a mixture of elation and exhaustion after she did that scene. Ray had worked like a definitive artist in this film, planning and orchestrating minute details and improvising it with several takes to capture subtle movements and delicate emotions. Many scenes were even sketched before the commercial production. In fact beautiful scenes such as the village dog trotting behind Appu and Durga, Water-skaters and dragon flies exploring the twigs and plants in the pond like Appu exploring his village, the larger-than-life witch-like shadow falling on the wall from the lamp at night during the time of storytelling, the majestic and memorable steam train billowing black smoke in the backdrop of the white kaash flower fields juxtaposed with the innocence of the kids (Ray has mentioned that five trains were used to shoot the scene) speaks volumes about what an astute director Ray was. It's the film's uncanny grip on humanity, the perfect casting, the moments of beauty and joy caught in ordinary life, and its visual integrity that make it such a rare delight even on repeated viewing. Another beautiful scene lies at the end of the movie. It is Apu’s concealment forever of the necklace once stolen by her sister; he throws it into the pond near the house, and the weeds slowly blink and close over the place where it falls. This is a delicate visual rendering similar to the snake that crawls into the deserted house after the family’s departure. These are masterly solutions to the problems that crop up during filming and they surely have held the audience in awe. The most important passages of music in Pather Panchali were composed by Ravi Shankar in an all-night session lasting about eleven hours until 4 AM because of Ravi Shanker’s touring commitments. Ravi Shankar already knew the novel of Bibhutibhushan Bandopadhyaya, on which the film is based, when Ray met him. He hummed a melody with the feeling of a folk-tune about it that became the main theme of the film, usually heard on a bamboo flute. The whole recording session was ‘hectic’, according to Ray, ‘with Ravi Shankar humming, strumming and instructing at a feverish pace, and the indefatigable Aloke Ray transcribing the composer’s ideas into notations. Shankar also composed two solo pieces - a life affirming one in Raga Desh which is conventionally associated with the rains and a somber piece Raga Thodi to follow Durga’s death in the storm. The high notes of Tarshehnai played when Sarbjaya burts out in grief were played by Daksinranjan Tagore in raga Patdeep, chosen by Ravi Shankar. "Pather Panchali” opened the eyes of the world to the beauty that lay in the most unexpected of places - rural, poverty-striken Bengal. And in the lives of those struggling to live there. 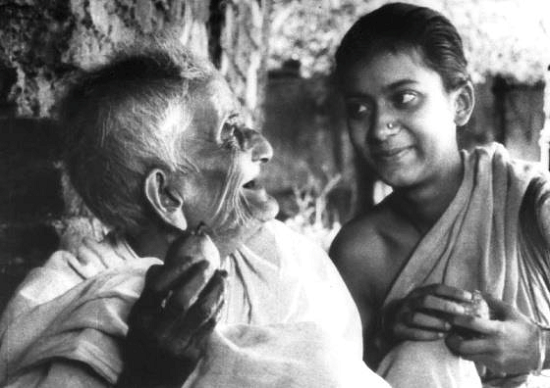 If there is something at the heart of "Pather Panchali", it is this overwhelming power of life that asserts itself even in the face of poverty, misery and death. It's Ray's integrity towards each and every character that makes the film so transcendent. "Pather Panchali"even today remains as the Taj Mahal of Indian cinema and a film of uncommon beauty and wondrous humanism.